SOS' old website, since deleted, shows Peters and Sargeant side by side. Sargeant now works for ResEd. This is the third part of a long-form article on the University’s decision to end student management at the Suites Eating Clubs. Click here to view parts one, two, and four. Student Organized Services, Inc. (SOS), contrary to its name and friendly-looking website, is not, and never has been, run by students. The for-profit, privately held company, headquartered in Redwood City, currently operates food-related labor services for the entire Row – a job contracted to it by ResEd. SOS’s CEO is Nick Peters ’94, who worked for ResEd before founding SOS in September of 1994. 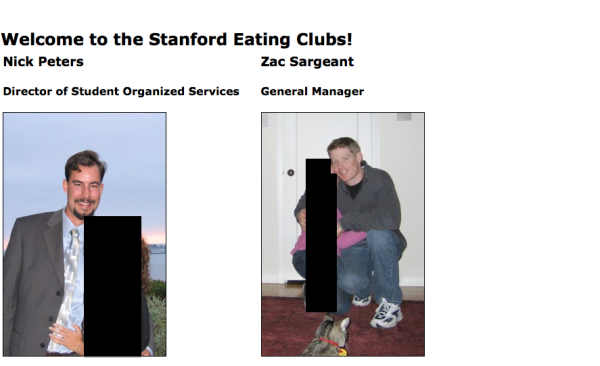 In 1995, Peters became CEO of another company: Stanford Eating Clubs (SEC), which took over management of the old student-run Toyon Eating Clubs while SOS began to expand, house by house, onto the Row. In 2005, Zac Sargeant took the helm at SEC as its CEO and managing director. 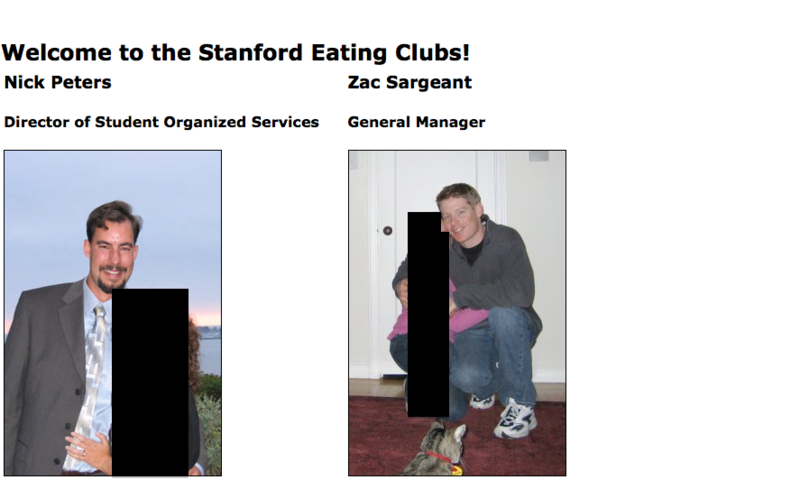 He was its last CEO – the formerly student-run Toyon Eating Clubs, founded in 1892, shut down in 2009 after 117 years of continuous operation. In 2008 – according to his résumé, while still serving as CEO of SEC – Sargeant was hired as Assistant Director of ResEd, where he works to this day. His office is just down the hallway from the boardroom in Tresidder Union where I had my interview with Boswell, Buzay and Golder. For one year, Sargeant simultaneously worked for a company that receives University dining contracts and for the Stanford office responsible for selecting dining contractors. Sargeant is also Peters’ brother-in-law. SOS’ old website, since deleted, shows Peters and Sargeant side by side. Sargeant now works for ResEd. According to Tony, SOS has repeatedly bid to administer Suites Dining since 1995, the year Peters assumed control at SEC and Tony’s first year as head chef in Avanti. GCDS student leadership felt comfortable running things on their own, according to Tony, and refused to contract their own jobs out to SOS. Sawyer, the former student manager and GCDS CEO who worked at Suites from 2005 to 2007, remembered Peters as a shadowy figure whose precise source of authority was unclear but who frequently attempted to wield that authority as a bludgeon against student independence. According to Sawyer, Peters clearly disliked Suites’ tradition of student freedom but lacked the power to do anything about it. Colin Wessells ’08 M.S. ’12 Ph.D. ’12 – who said the business experience he gained as financial manager in Avanti from 2006 to 2008 eventually helped him become CEO of his own Silicon Valley startup – has a clear memory of Peters: as a businessman who repeatedly offered the clubs a bad deal. “Every year or so he would come over to Suites and see if, now that there was new student management there, they would be interested in partnering with SOS,” Wessells recalled. Student managers, however, weren’t buying it. According to Wessells, that proposed administrative fee typically amounted to between $100 and $200 per resident per quarter, on top of the existing board bill. Multiplied by the roughly 260 students in Suites, SOS’s bid for service, if successful, would have netted Peters’ firm between $78,000 and $156,000 in student money every year. But a long tradition of student independence, and a lack of concrete administrative power over Suites Dining, stood in their way. Then Peters’ brother-in-law joined ResEd, and the balance of power began to shift. It was not until 2009 – the year after ResEd hired Sargeant as its assistant director – that, according to chefs and former student managers, the threat of an SOS takeover became realistic. First ResEd began regulating Suites’ financial operations. Administrators then assumed control of paying student hashers – and began paying them less. Then ResEd cut a managerial position from each club, reducing the total number of student managers from 12 to the current eight. When chefs and managers, fearful of a complete SOS takeover, finally discovered the relationship between Sargeant and Peters in the spring of 2011, ResEd denied the existence of any conflict of interest. ResEd eventually abandoned its attempt to replace student leadership with an outside contractor, and Boswell admitted that Suites managers had “worked diligently over the course of the summer to meet all relevant, upgraded University requirements.” Captained by Sullivan, then the GCDS CEO, Suites managers won their right to remain independent. Or so they thought. In our interview, Golder denied that SOS had ever been involved, in any capacity, with Suites Dining during her tenure. Frank used to work for SOS. He left in 2007 when, a few weeks into the school year, he was recruited away by then-GCDS CEO Sawyer to work in Bollard instead. Sawyer puts it more bluntly. Frank, in typical fashion, only expresses concerns about his students, and especially about what might happen to them after an SOS takeover at Suites next year. Suites Dining is the largest remaining student-run, independent eating location on campus, with approximately 260 residents and an annual operating budget of over $1.1 million. Whichever company wins that contract next year will be flush with cash – cash ResEd requires students to pay, and cash from which any for-profit corporation will skim significant fees. If the past is any indication of the future, that corporation will likely be SOS. 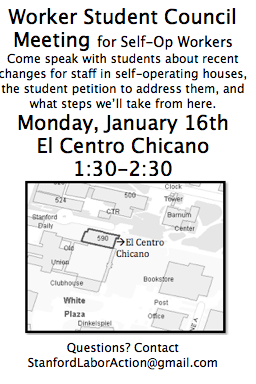 The entanglement between Stanford’s Office of Residential Education and SOS is complex and runs deep. When I contacted Peters to request a personal interview for this story, he declined to speak with me and referred me instead to Buzay in ResEd, who handles all of SOS’s media inquiries. Boswell mentioned in our interview that he himself was “connected” to SOS, but doesn’t specify how. Sargeant, the onetime General Manager of SEC and Peters’ brother-in-law, was still reluctant to talk. “I believe that Aaron and Nate can provide you with all the information requested,” he wrote in response to my emailed request for an interview. When Avanti chef Tony said there’s “something insidious about this whole thing,” these are the kind of connections that support his suspicion. Wessells, the former Avanti financial manager, speculated that money might be changing hands somewhere. Despite Golder’s assertion that a “University-required” bidding process governs the selection of contracted vendors for student residences, SOS did not have to competitively bid to manage the Row for over 15 years. The first year for which ResEd held a bidding process for Row management was 2011-12. In the year after receiving that bid – according to members of the Stanford Labor Action Coalition (SLAC), a student-led workers’ advocacy group – SOS slashed Row workers’ health benefits by half and reduced their bonuses from $1,000 to a maximum of $40. 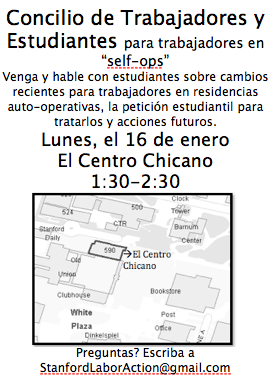 But when SLAC held a Worker-Student Council meeting on Jan. 16, 2012, to provide a “safe space” for workers seeking relief from SOS benefit cuts – advertised in both Spanish and English – Sargeant, a ResEd employee, barged in without introducing himself a few minutes into the meeting, accused the workers of organizing a strike (which SLAC had never discussed) and “intimidated” the workers into silence. SOS’s financial operations for the Row are almost completely opaque to house residents. When I met with a Row financial manager to go over his house’s finances, he was surprised to learn that Suites residents have full and transparent access to their entire board bill. ResEd, he said, takes all the money from his residents’ room and board payment, gives him about $850 per resident per quarter to spend on either food or social dues and doesn’t tell him what they do with the rest. “Even as a financial manager, I don’t see where half the student money goes,” he said. I end up having to go directly to Buzay for that information. The numbers, which Row financial managers never see, are clear. Total board bill costs in Suites and on the Row are almost exactly the same – $5,999 per year for Suites residents and $5,992 for residents on the Row. But there’s one major difference: Governor’s Corner Dining Societies deliver seven more meals per week than Row houses for almost exactly the same price. Row residents receive 10 meals a week, typically lunch and dinner Monday through Friday. Suites residents, by contrast, get 17: everything the Row provides, including open kitchen and snacks, plus a custom-cooked Frank breakfast extravaganza every morning and brunch and dinner on Sundays. Suites student managers provide those seven extra meals, moreover, on a lower food budget. GCDS spends about $50 less per quarter per student on food than SOS (an average of $726 for GCDS and $775 for SOS). And they provide those meals – as any student who has had Dennis’ lobster, Frank’s filet mignon sandwiches, Caroline’s Mexican or Tony’s chocolate mousse can tell you – without compromising quality, a feat Tony says he accomplishes by buying only “what’s seasonal and freshly available” and “minimizing or eliminating waste.” That’s not even including the quarterly Gala Dinners and Special Dinners every Suites eating club delivers or the spring quarter Suites-wide Special Party, for which student managers bring in live music, ice sculptures and entertainment. And as a student-run nonprofit, all the money Suites saves on food goes to better pay for student hashers and their chefs, rather than the bank account of a for-profit company. Frank made $900 per week for 33 weeks of work – about $29,700 annually – when he first started at SOS. He makes $20,000 more than that at Suites, plus 100 percent coverage of his (and his dependents’) healthcare and dental costs. In “Hiring a Chef,” the sample advertisement SOS CEO Peters encourages student managers on the Row to post when searching for new chefs, Peters suggests pay of “$800/week DOE [depending on experience] + negotiable benefits.” That’s $26,400 per year – about half what Suites chefs make. Part-time student hashers at Suites make $15 an hour, and used to make even more before ResEd-enforced pay cuts took their toll. Even after the ResEd pay cuts, Suites hashers still make more than the Stanford-mandated living wage. Buzay, however, said that Peters – the CEO of the organization responsible for food-service labor operations for the entire Row – “didn’t know” that Stanford’s Living Wage Policy, enacted in 2007, “even existed” until four years after it came into effect. In 2011, SOS was finally forced to conform to the policy, which mandates that all campus workers, including those hired by third-party contractors, be paid at least $12.40 an hour when also provided with benefits. But there’s no better way to compare the performance of SOS and GCDS than to talk to someone who’s experienced both. When I finally sat down with a former Suites hasher who currently lives on the Row, his answer is clear: GCDS outperforms SOS in every area of food service. “The food is better, the open kitchen is better – everything is way better,” he said of Suites Dining. He thinks it’s “stupid” of ResEd to consider contracting management of Suites to any outside company, much less SOS. When I told him one of ResEd’s ostensible justifications for eliminating GCDS is health and safety concerns, he laughed in disbelief. “We have so many health violations,” he said of the SOS-managed Row house in which he currently lives. “The number of violations we have…” He trailed off, shaking his head. When I asked him to list some of the specific health violations in his house, he demurred, afraid that his kitchen staff might lose their jobs. For the 2011-12 bidding process for the Row – the first it had ever held – ResEd conducted a closed bid in which, according to Buzay, four vendors submitted offers: Aramark, CollegeChefs, Sodexo and SOS. First of all, that description sounds an awful lot like GCDS, which is entirely made up of students from their own living community. And second, in a closed bidding process in which SOS’s only three competitors were two multinationals that have no experience working closely with students on Stanford’s campus and a third company with a terrible reputation for its work on college campuses, SOS’s selection to manage the Row was likely a foregone conclusion. Boswell, Buzay and Golder claimed not to know who will be selected as the bidders for next year’s Suites contract. But given ResEd’s past bidding practices on the Row, there’s little reason to believe the bidding process for Suites will go any differently.